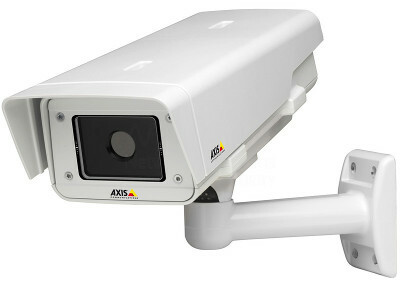 Over the last few year, Axis has expanded into thermal cameras. While the company is well known and respected for conventional IP cameras, thermal is outside their historic sweet spot, raising questions of how well would their thermal offerings compete. We put the Axis Q1921-E and Q1922-E to the test against FLIR, DRS, Pelco and Sightlogix to see how Axis's thermal image quality and usability matched up. Good detail at close range, better than most competitive models but not the best. Reliable detection at long ranges, performing on par with most competitors. One of few cameras in our tests which required no configuration tweaks to improve image quality. More palette, equalization, and image quality options than many competitive models, second only to FLIR. No included on-board analytics, but multiple third-party options available through Axis' camera application platform. Price: The Q19 series ranges in price from about $3,000 for the Q1910 to $8,000 for the long-range Q1922-E. In both close and far range tests, Axis performed better than average, though was not top in either category. However, it performed well without any image quality enhancements, with all settings left defaulted and equalization set to automatic. Additionally, due to Axis' widespread use and position in the market, users may prefer it due to its many direct integrations and familiar web interface. Other cameras in our tests have no web interface, requiring an external program for configuration, and some integrate only via ONVIF. Cable-through mount and housing similar to other Axis -E outdoor models, may be familiar to many integrators. 12/24V and PoE power supported. Analog video output, I/O, and audio included. Users may select from eight different palettes, though as we have discussed in other reports, white hot and black hot are generally most useful. Axis offers contrast and brightness enhancement, as well as flexible equalization settings. We found the defaults to be a good balance of these parameters, though specific scenes may warrant adjustment. 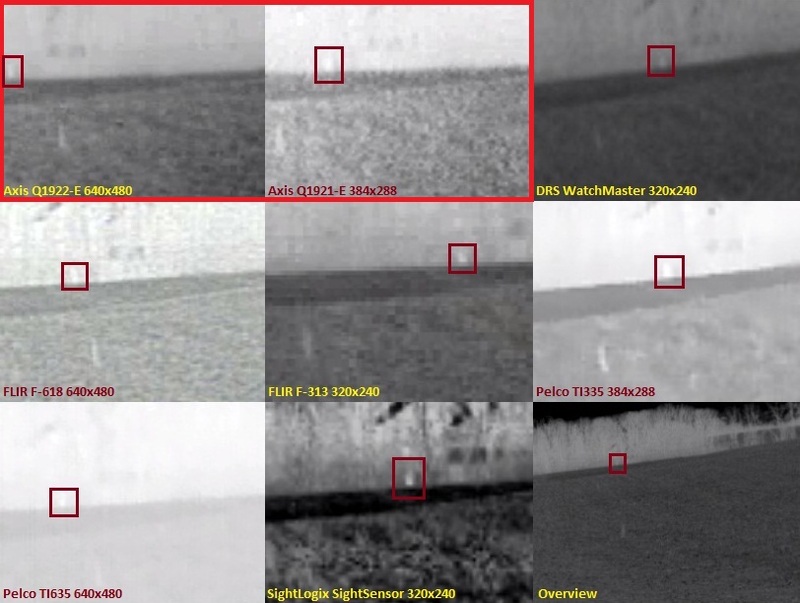 In our thermal camera shootout, Axis' Q19 models provided good detail at near range. In both Axis cameras, highlighted below, the subject's clothing is more distinguishable than in competitive images, with the exception of Pelco. Pelco edges out Axis by showing the subject's glasses, not seen in any other image. Interestingly, both Pelco and Axis use the same OEM thermal cores. 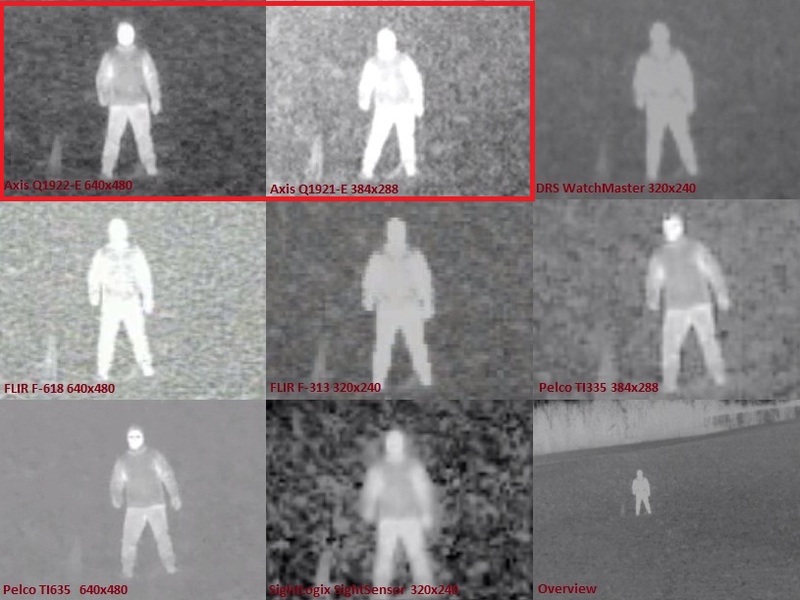 Generally, thermal cameras are considered for detection only, but details such as clothing may be useful in identifying subjects post-event. At ~1,800', detection capability was good in the VGA Q1922, with the subject relatively easy to spot against the trees in the background. Contrast in the 384x288 Q1921 was not quite as high, making the subject more difficult to spot. Note that the only adjustment made to the Axis cameras in this scene was to change the equalization zone to exclude sky in the image.